(Trent Nelson | The Salt Lake Tribune) Brigham Young Cougars guard Jahshire Hardnett (0) shoots a free throw as BYU hosts San Diego, NCAA basketball in Provo Saturday January 20, 2018. Reno, Nev. • Unranked BYU went toe-to-toe with No. 7-ranked Nevada for most of Tuesday’s college basketball season opener, but the defending Mountain West Conference champion Wolf Pack had too much size and firepower down the stretch and took an 86-70 win. In a foul-filled meeting at sold-out Lawlor Events Center, the Wolf Pack got 25 points and 16 rebounds from Jordan Caroline and 21 from Caleb Martin — all in the second half — to hold off the Cougars’ upset bid. BYU made more field goals than the home team, 26-25, but Nevada was 28 of 39 from the free-throw line. The Cougars were 12 of 19 from the line. In all, 47 fouls were called in the game — 27 on BYU. BYU led 52-49 after a pair of free throws by Jahshire Hardnett with just under 14 minutes remaining. But the Wolf Pack went on a 10-0 run to take a lead it would not relinquish. After making their first seven shots of the second half, the Cougars missed six straight shots to lose their lead. “We had every chance in the world, but we let one get away at home against a team that is going to have a really good season,” Rose said. 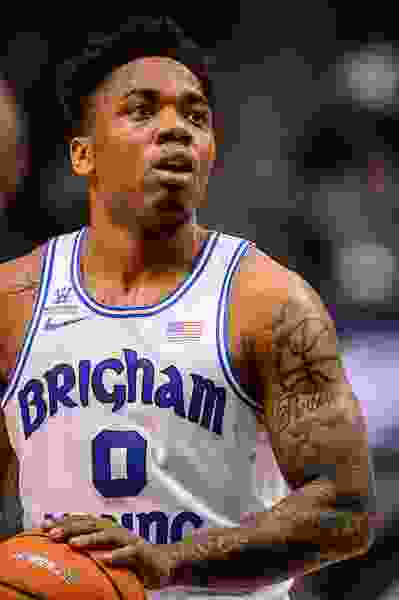 Hardnett led BYU with 17 points, while Yoeli Childs added 16 points and 12 rebounds. However, Childs picked up his third and fourth fouls in the first 50 seconds of the second half and spent the next eight minutes on the bench. He returned with 11 minutes remaining and made a basket to cut Nevada’s lead to 59-54 and Rylan Bergersen followed with a 3-pointer to trim the deficit to two. “We kinda panicked a little bit,” Rose said of the second-half stretch when BYU lost the lead. The Cougars shot just 20 percent from 3-point range (6 of 31) and were out-rebounded 48-44 by the much taller Wolf Pack. Rose replaced senior captain Luke Worthington in the starting lineup with junior Dalton Nixon in an attempt to get a quicker, more athletic team on the floor, but sacrificed size in the process. The Cougars looked jittery and nervous at the start, and missed their first nine shots, their first five 3-point attempts, and fell behind 9-0 four minutes into the game. Zac Seljaas finally hit a trey with more than five minutes gone to put the Cougars on the board, and BYU slowly crawled back into it. T.J. Haws’ 3-pointer gave the Cougars a 22-20 lead, but Nevada surged ahead again and BYU looked in trouble when Childs went to the bench with his second foul with three minutes remaining in the half. But the Cougars ended the half on a 6-0 run, and the teams went to their respective locker rooms tied at 34. “We have that depth down the whole bench to be able to fight back [from deficits] this year,” Seljaas said. Twenty-seven fouls were called in the first half, 15 on BYU and 12 on the Wolf Pack. Five Cougars had two fouls in the first half, and Worthington had three. Nixon eventually fouled out, joining Childs on the bench. Martin, a preseason All-American who led Nevada to the Sweet 16 last March, got in foul trouble in the first half and didn’t score in the first 20 minutes. He was brilliant in the second half, however, including a 10 of 12 effort from the free-throw line. Both teams shot 38 percent from the field. Nevada was 8 of 28 from 3-point range, with Portland transfer Jazz Johnson going 3 of 7 from deep after sitting out last season due to NCAA transfer rules. The Wolf Pack shot 52 percent in the second half, however, to pull away in the final 10 minutes. The Cougars play host to Utah Valley on Friday in their home opener at the Marriott Center. Tipoff is at 8 p.m.
• No. 7 Nevada uses a big advantage at the free-throw line and Caleb Martin’s big second half to hold off BYU’s upset bid . • Yoeli Childs has16 points and 12 rebounds despite foul problems that limit his playing time. • The Cougars make their first seven shots in the second half to build a three-point lead, then miss six straight shots.